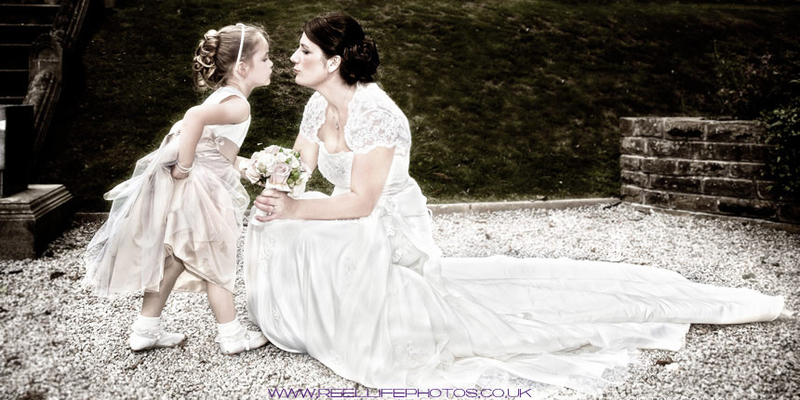 Waterton Park Wedding video in Wakefield shot whilst also hired as the couple's offcial wedding photographer. 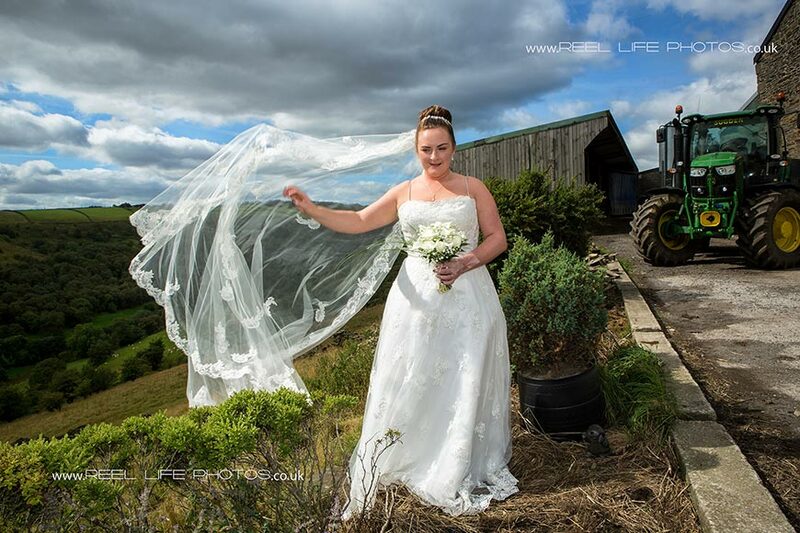 Wedding in North Yorkshire - picture taken on the family's farm, before going to the wedding ceremony. The little bridesmaid has fallen and hurt her knee so runs to her mum, the bride, to be kissed better. Natural wedding photography in Whitby and even posed pics of the happy couple should have great expressions, if they are having fun with their wedding photographer! Even though we are happy to travel to absolutely anywhere in the whole wide world - both Internationally and anywhere in the UK - for lovely people's weddings, Yorkshire is our home so we are very familiar with virtually all possible wedding venues in the county, both in West Yorkshire and North Yorkshire, South Yorkshire, East Yorkshire & Humberside, as well as neighbouring counties like Cheshire, Lancashire, Cumbria and Derbyshire! We love any culture or ethnicity, so have been privileged to share many interested weddings, such as Nigerian and mixed race weddings, Chinese weddings, Asian weddings - Sikh, Hindu, and Muslim - both locally and travelling many, many miles! 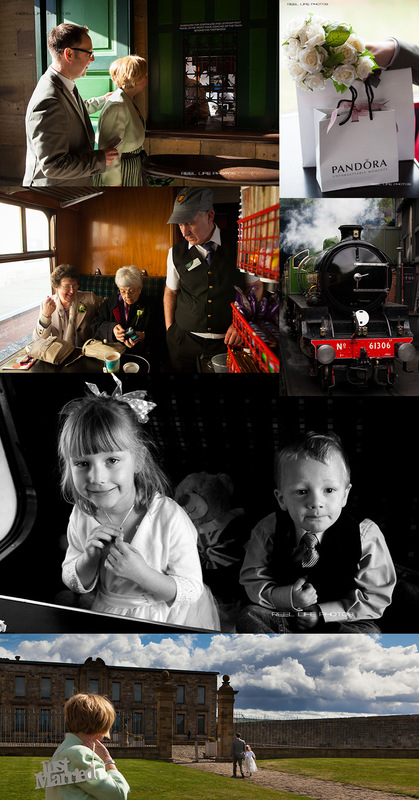 See here for a storybook from a wedding in Huddersfield and here for a storybook wedding near Rotherham. Jorge was the wedding photographer in the first storybook, as I had a wedding in Leeds the day before then got straight on a plane to Dublin and picked up a hired car to get to Kilkea Castle cover the wedding photography over in Southern Ireland! * Was recently awarded FIRST prize in the INTERNATIONAL WEDDING PHOTOGRAPHERS EXCELLENCE AWARDS! The brief was to submit 5 images from the same wedding that showed the excitement and emotions of a wedding day. Am totally bowled over that I actually won it! We took these photos at a mixed culture wedding in Leeds, and then covered video and photos for another local couple at Waterton Park Hotel. Earlier we were the wedding photography & video team at an Asian wedding - in the snow - in Bradford at the Mirage. Later we had another 4 day traditional Muslim Asian wedding at the Khidmat Centre, Lala's, and The Venue - all in Bradford - and recently were the wedding photographers at another two Asian weddings, one in at Aashiq's Restaurant, The Grand Banqueting Suite on Huddersfield Road in Dewsbury and at Soothill Community Centre in Batley, and the other also in Dewsbury. You can see some more Asian wedding photos and here and here too and on our Asian wedding page. Our most unusual wedding was a small Humanist wedding - outdoors in the woods in Leeds for video and photos. Below are two pics from recent weddings - one in Dewsbury and the other in Liversedge. 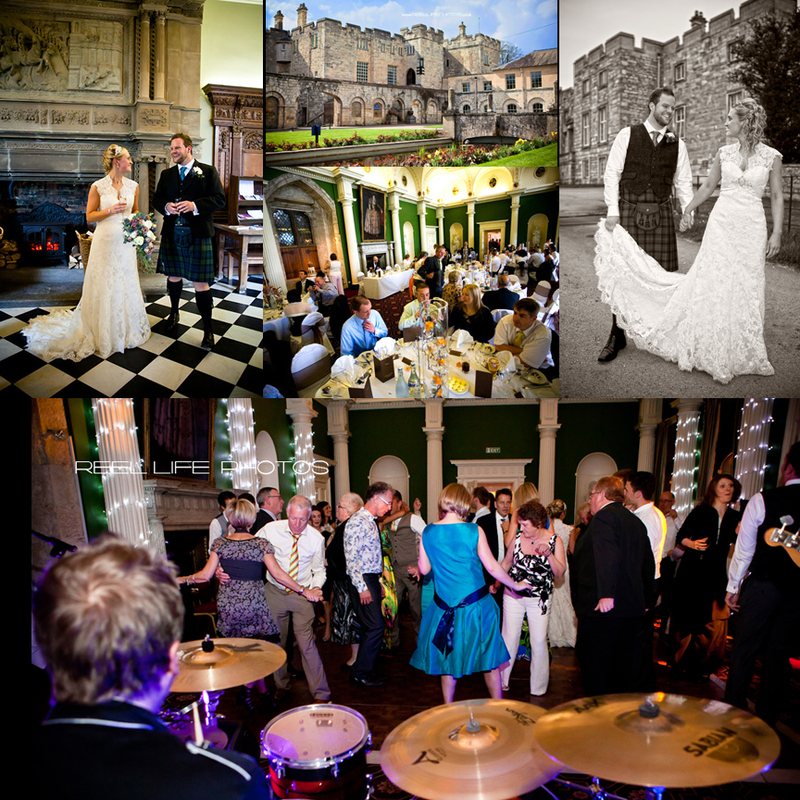 If you want to see a grand, but down to earth wedding at Hazlewood Castle on a cold rainy day in May last year for a bride whose many friend's weddings we have also photographed, I think you will enjoy these photos. Please look though, as there are over 300 photos there representing their whole wedding day. Here is just one as a token from that day...(click to see). Give us a call to see if we can help you have a wonderful wedding day! Other weddings in our Facebook Albums - Martin and Helen's unusual wedding ceremony in Whitby, their wedding "car" pics here and wedding cake here, and more of their natural wedding pics here and here, Naz and Bilal's Asian Muslim wedding in Wakefield and here and here, an Arabic wedding in London - just the wedding breakfast cuisine and here showing the venue only, and Caroline and Ahmed's Egyptian Muslim wedding in Sheffield and here the interracial bride and groom eating icecream in Sheffield Botanical gardens, and Esther and Tom's church wedding ceremony in Scotland, and here their wedding reception, and more of their natural wedding pictures. Nigerian couple's emotional and colourful Autumn wedding in Worcester, at St Peter's Baptist Church. Great fun to observe the story of their day and record these images as they unfolded before me. The happiest moments from this joyous Nigerian bride. See more in the various photo albums on our Facebook page. See more Nigerian and Gambian weddings on our African wedding page too! We've been the professional wedding photographers and videographers for lovely bride and grooms all over the UK, in every imaginable wedding venue in West Yorkshire in Bagden Hall, Waterton Park Hotel and click here for a storybook wedding at Waterton Park Hotel, National Trust property Nostell Priory, Oulton Hall, Woolley Hall and click here: and here for Autumn wedding pictures at Woolley Hall, Woolley Hall website Ripley Castle website, a winter wedding at Leeds Met Hotel Metropole. Chevin Lodge Hotel near Otley, Leeds, Allerton Castle, Hazlewood Castle and more Hazelwood Castle wedding pictures here, Monk Fryston Hotel near Selby, Holiday Inn Leeds Garforth Holdsworth House, Clay House, Oakwell Hall, for the Dewsbury, Cleckheaton, Batley area we often cover wedding photgraphy at Gomersal Park Hotel. See here for Gomersal Park Hotel wedding pictures and the preceding church wedding at St.Patricks Church in Batley and for and for Oakwood Hall in Bingley see here and see here for wedding pictures at Blenheim House, and here for Pennine Manor Hotel in Golcar, Heath Cottage, Healds Hall, Alder House, Bagden Hall, Hatfeld Hall, Weetwood Hall and here for a civil partnership wedding at Woodlands in Leeds, an urban wedding in the centre of Leeds see here for black and white wedding photography: and here for more urban reportage wedding pictures in Leeds, Kings Croft wedding venue near Pontefract, and I'm sure I'll remember a few more later on round Heckmondwike, Huddersfield, Halifax, Wakefield, Ossett, Batley, Dewsbury. 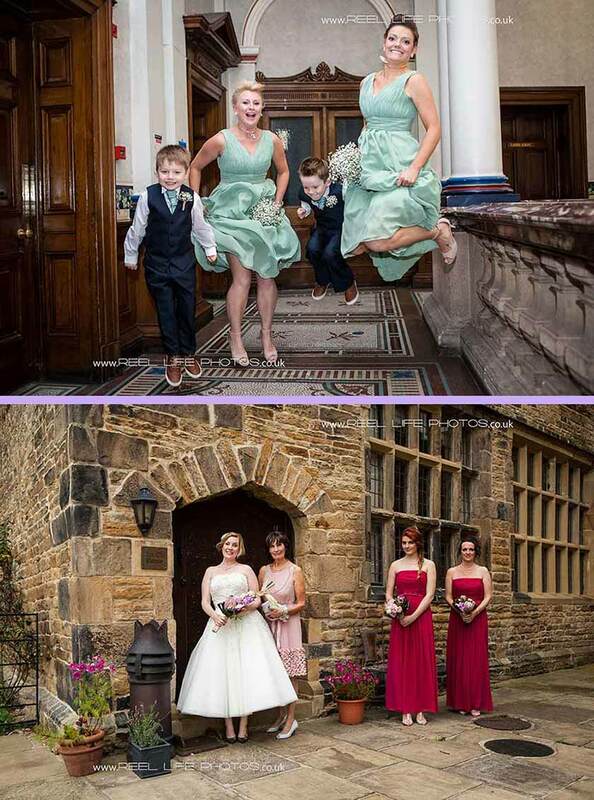 Keighely, Silsden, Skipton see here: Bradford, Leeds, and in South Yorkshire wedding venues such as Worsley Hall in Barnsley, Hellaby Hall in Doncaster see here: and other wedding venues near Sheffield and Rotherham. Nearly missed out wedding venues in Harrogate and Knaresborough, as well as lovely places in East Yorkshire such as the KP Club Glasshouse near Pocklington.